Bank Negara Malaysia made a comeback for RM20 banknote. It was released for circulation on 16 July 2012. The banknotes are supplied by Crane AB of Sweden, Giesecke & Devrient GmbH of Germany, Oberthur Technologies of France and Orell Fussli of Switzerland. Therefore no one really knows which printer prints which banknote. 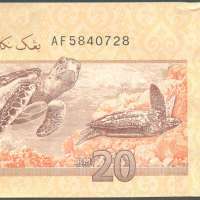 As ambassadors of the rich and colourful marine life found in our tropical waters, two of the most well-known species of sea turtles endemic to Malaysian waters are on the new RM20 banknote - the Hawksbill Turtle (Eretmochelys imbricata) and Leatherback Turtle (Dermochelys coriacea). The Hawksbill is easily identified by its curved beak and scaly shell while the Leatherback has a leathery skin and seven ridges on its shell. These gentle turtles are a reminder that their existence rests in the delicate balance of human activity and marine life conservation.